Deputy Chief Minister, Chowna Mein mooted for forming an state policy on Road Safety citing that road accident is a serious issue and a growing menace in which every year large numbers of people losses their life or suffered grievous injuries due to accident. He was attending the inaugural programme of the five days training on “Road Safety Audit and Road Engineering Related Aspects” for Senior Engineers of the state as chief guest at Administrative Training Institute, Naharlagun today. On learning that The United Nations General Assembly adopted a resolution on “Improving Global Road Safety” and there is standing direction from the Supreme Court of India for forming road safety policy in every states, Deputy CM asked the Commissioners, PWD and Transport to come up with a cabinet note to be placed before the state cabinet for formation of the same. He said that without the support of the govt and without proper policy & programme, road safety measures like awareness campaigns, training and other related safety issues cannot be fully addressed and implemented, hence forming a policy is essential. He also urged the departments to take the help of NGOs and social organizations to create massive awareness on road safety. He further said that though we have stringent laws but it is not properly implemented. He said, “most of the accidents are result of not following road safety measures either by the drivers or the peddlers. We need to change our mindset and adopt road safety measures as we still view the safety measures as a binding enforced on us or some view it to be safe from penalty of traffic police while forgetting that it is meant for our own safeguard and protection”. 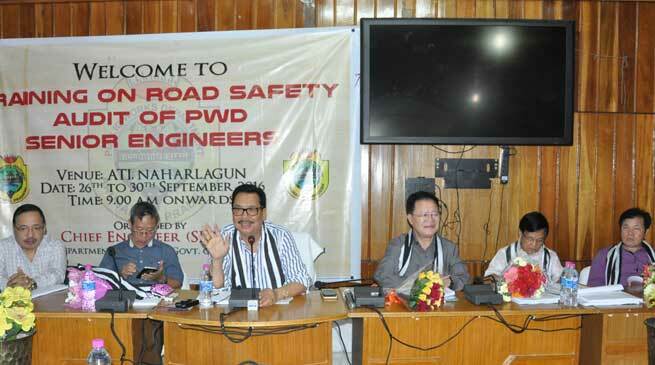 Commissioner PWD, Hage Khoda stated that incidents of road accidents in Arunachal Pradesh are much above the national average. With day by day increasing numbers of vehicles in the state which is currently more than 1 lakh 70 thousands and with no semblance of road safety measures, many precious lives are lost every year, which is very alarming, he said. He called for massive awareness campaign on road safety measures in schools, colleges and at district and at sub-divisional levels. He also said for strict enforcement of road safety law, testing of the skills of drivers before issuing driving licence and to check indiscriminate issuing of driving licence to reduce mortality rates due to road accidents. Citing drunk-driving and rash driving as the major cause of road accidents, he called to strongly deal with them as per the law. Commissioner Transport, Bolung Siram informed that there is a separate committee for road safety in the Supreme Court of India and the same committee is regularly monitoring the road safety measures taken by the states every month. He also informed that State level Road Safety Council and District Level Councils were formed in the year 2015. However, he sadly informed that the govt is yet to receive minutes and reports from the District Level Councils till date. Dr S Velumurugan, Senior Principal Scientist & Head, TES Division, Council of Scientific & Industrial Research (CSIR) – Central Road Research Institute (CRRI), New Delhi informed that 1.4 million people are killed and 50 million people are injured worldwide per annum due to road crashes. Developing countries account for 90% of the casualties and road crash is the leading cause of death of young people worldwide. He informed that if unabated, the number of deaths will increase to 1.9 million per annum (worldwide) by 2020.
WHO has declared 2011 to 2020 to be the Decade of Action for Road Safety with the goal to prevent five million road traffic deaths globally by 2020 and India has rightly joined this endeavour. Among others PWD Chief Engineers, Hage Appa (Training & Vigilance), Kenjum Ete (Eastern Zone), Bora Ete (Highway), Joint Secretary Nyali Ete and Senior Engineers were also present on the occasion.